Orange-red-covered strips, which of relatively high freshness after drying. Slight sweet taste, neither sour nor bitter when brewing. This Chenpi Herbal Tea is a great daily drinking for people who have digestive problems or cough, phlegm problems. TeaVivre’s Chenpi strips are all handmade, with a scarlet-orange outer skin and pale, yellowish-white inner skin. 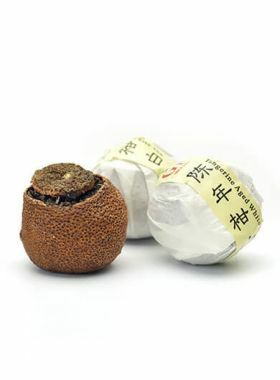 The dry peel is thick yet fragile, and when brewed in hot water, the liquid immediately steeps out as a bright yellowish green with a heavy tangerine fragrance. It taste mellow and sweet without being sour or bitter in the slightest - and also promotes your appetite! Chenpi can be brewed on its own or with tea of another type, or even used in cooking. Note: Some of the tangerine peels have small white or black spots on the outside - this is a natural phenomenon in the growth of the fruit, and not a sign of mold. * You can improve the taste by changing the amount or adding rock candy, milk, and honey according to your personal preference. 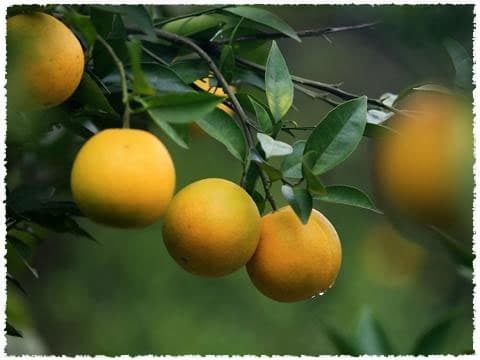 It is well known that tangerines are sweet and delicious, and rich in vitamin C. According to traditional Chinese medicine, the peels are called “Chenpi”. The source of bitterness in the peels comes from limonoids, represented by lemon glycosides; this kind of limonoid is mild and soluble, and beneficial for digestion. When cooking with tangerine peels, this bitterness mixes and reconciles with other flavors, and as a result produces a special, unique taste. Note: Fresh tangerine peels contain a lot of volatile oils, which may cause stomach irritation. 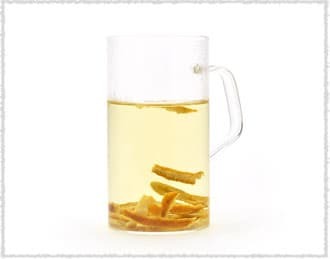 Fresh peels do not have the same medicinal effects as Chenpi, and as such are not suitable for drinking like this dried Chenpi is. Jiangxi Province is located in the southeastern part of China near the Tropic of Cancer, resulting in a warm climate and abundant rainfall, with the average yearly precipitation here sometimes approaching 2000mm. Rice is the dominant crop in the area with wheat coming second, and other crops such as cole, cotton, oil-tea, and tea abundantly grown as well. Most of the teas in Jiangxi are produced in the northern mountains, with some famous types being Lu Shan Yun Wu green tea, Ning Hong Gongfu black tea, and Jiangxi Wuyuan green tea. Moreover, Jingdezhen, the distinguished ‘porcelain capital’, is located in Jiangxi. Herbal tea refers to any beverage made from the infusion of plant material such as the flower, stem, leaf, or even root, so long as it does not come from the traditional tea plant, Camellia sinensis. These 100% natural ingredients, with no artificial colors or caffeine content, are guaranteed to have good quality; we can say that these attractive herbal teas, rich in nutrients like vitamins B, C, and E, are not only pleasant to look at but also healthy to drink.